We turn once more to a category of stamps which show that no tax has been paid on beer, the Export Beer Stamps. It remains a mystery to me why the late Tom Priester did not include these stamps in his monumental work, United States Beer Stamps (First Edition, 1979; Second Edition, 1990). I remind you once again that collectors will find that the first edition of the Priester work contains a significant amount of additional explanatory material, well worth the additional cost if one can find a used copy. Before 1891 a brewery, wishing to export beer, would have had to pay the tax and then, after exporting the beer, apply to Internal Revenue for a drawback (refund) of the taxes on the beer that had been shipped abroad. The 1890 law changed that procedure to encourage the manufacture of beer for export. 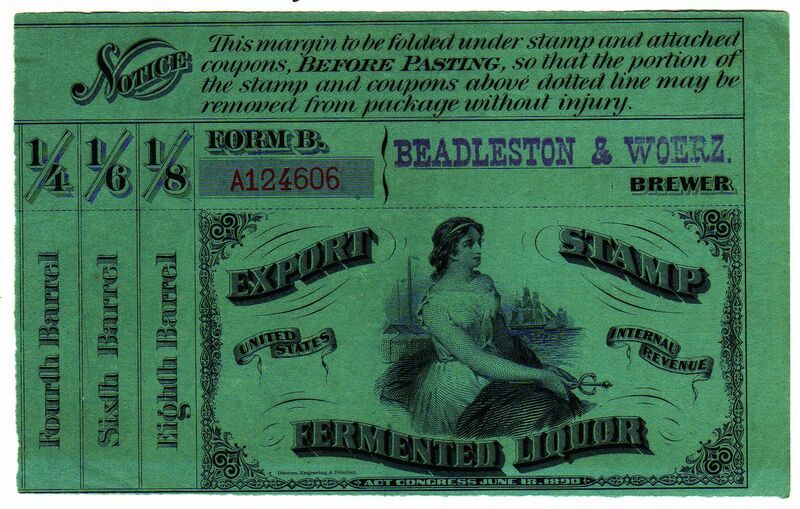 The Series of 1891 Export Fermented Liquor Stamp was issued by Internal Revenue for placement on kegs of beer intended for export. 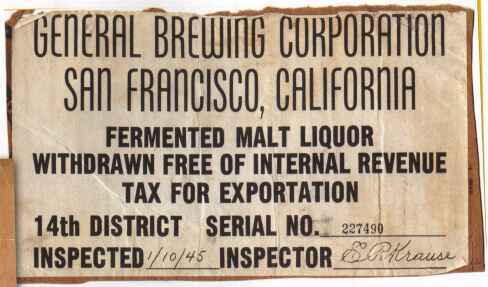 The brewery, when it placed this stamp on the keg, did not need to pay the internal revenue tax (in 1891, $1.00 per barrel of 31 gallons). The stamp has a number of coupons on the left so that by cutting at the right place the stamp is appropriate for 1/8, 1/6, 1/4, 1/3, 1/2, 1 bbl, or 1 hhd, the permitted sizes of kegs in which beer was shipped from the brewery. The stamp has been trimmed prior to being applied to the container. This particular stamp was one of the 140,000 that were printed and delivered during the first fiscal year of deliveries. So, here we have a stamp authorized by the tax law, issued by Internal Revenue, and printed by the Bureau of Engraving and Printing. It does not have an indication that a tax has been paid. Rather it designates something as legally tax exempt. To my way of thinking, this stamp belongs in a beer stamp collection, as a way of telling the complete story of the taxation of beer. It is a revenue or tax stamp, it just designates that the tax is zero! The stamp has long been known to the philatelic community, having been listed in the 1912 Springfield List (United States Internal Revenue Stamps, Hydrometers, Lock Seals, by J. Delano Bartlett and Walter W. Norton, published by the United States Revenue Society, Springfield, Massachusetts). A portion of the stamp was illustrated in the fifth and ninth editions of Springer’s Handbook of North American Cinderella Stamps, Including Taxpaid Revenues. The first time it was illustrated, more or less whole, was at the time of the dispersal of the John S. Bobo collection (Michael E. Aldrich Auction No. 24, November 24, 1986). Rather humourously, the pictured stamp in the auction was one in which the top portion of the stamp had been removed and reattached upside down! Auction lot number 1104’s description reads “...considered by many to be unique.” Alas, one must be wary of the auctioneer’s hyperbole. There is one well-known collector who has three copies on different colored papers, a second collector with two copies on different colored papers, and another three collectors that are known to have a single copy. All in addition to the unique copy in the 1986 auction! Unused copies have the tab at top; used copies have the tab removed. So the copy in the Bobo sale was probably intended for use, had the tab cut off, and then reattached when the brewery failed to use the stamp. Most of the copies in collections today are unused remainders. There has also been reported a label for Fermented Liquor in Bottles for Export. These case stamps (Figure 2) are serially numbered like their cousins intended for beer in kegs. They are also multipurpose labels that are torn to show the quantity of beer in the package. Only two copies of this label have been reported. These were almost certainly not printed by the Bureau of Engraving and Printing. Little remains unknown about these curious case stamps, but as we shall see, privately printed case labels became the norm for bottled beer that was being exported after the end of Prohibition in 1933. 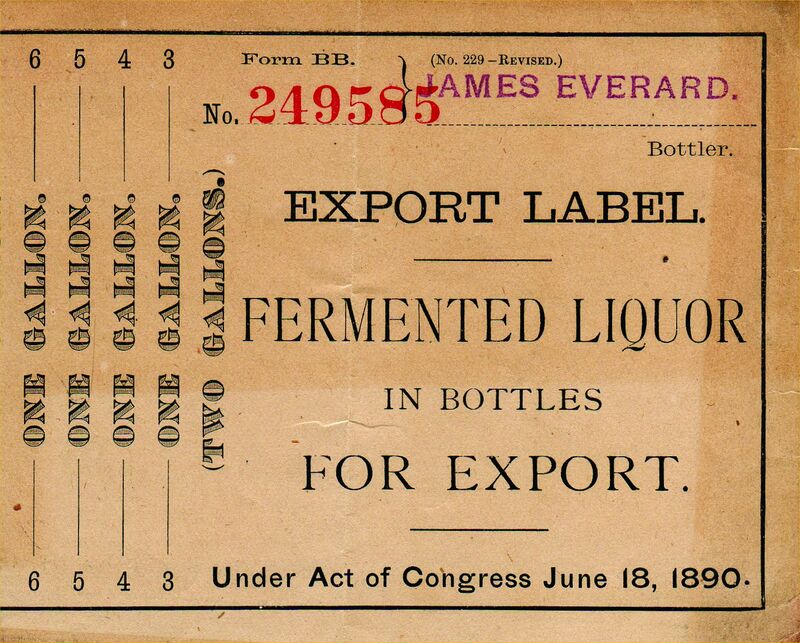 The Series of 1891 Export Fermented Liquor Stamp remained in service about 20 years, until it was replaced by a similar Series of 1911 stamp. To the best of my knowledge only one complete stamp from the Series of 1911 has been recorded. It is not illustrated here. Finally we turn to the privately produced labels for beer exported in bottles that are known after the end of Prohibition. Two are illustrated here (Figures 3 and 4). Their status as revenues is probably questionable, but at least the 1945 example (Figure 3) has been signed by a government inspector and should at least find a home in a specialized collection of beer tax paids and tax exempts.